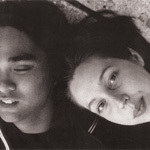 The Pacific Ocean formed in the late '90s when Ed Baluyut (ex-Flower, ex-Versus), and Connie Lovatt (ex-Alkaline, Containe) joined forces in New York. The duo experimented with low tones and occasional upbeat and dramatic musings. They released the Birds Don't Think They're Flying EP on Enchante Records in 1997. The band followed with the Less Than the Needle, More Than the Shotgun album in 2000, also on Enchante. The band toured extensively with the likes of Versus, Whysall Lane, Andrew Beaujon, and Chemosake.